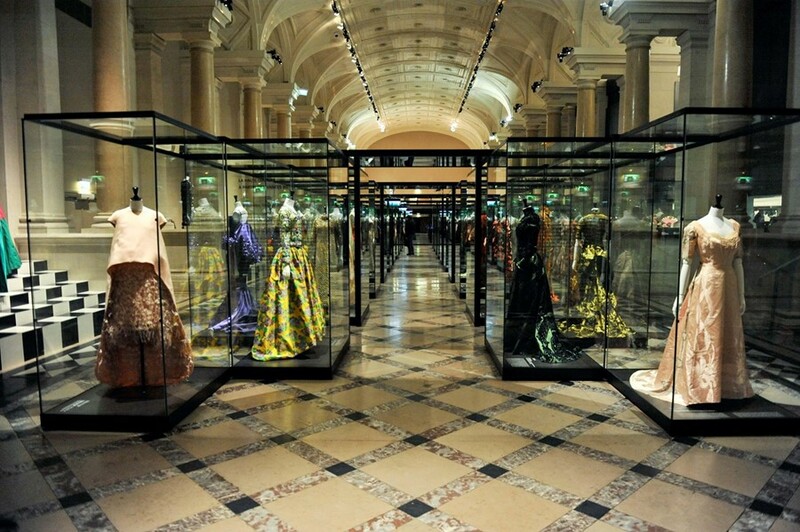 One hundred dresses on display to get up close and personal with. All the haute couture greats of the past century and a half. All to see for free in Paris, which is a known rarity. That’s the simple directive of the new exhibition, simply titled “Paris Haute Couture”, which opens on March 2nd in the Salle Saint-Jean of Hotel de Ville, sponsored by Swarovski. Swarovski plays a crucial role in restoring pieces such as a 1958 Balenciaga silk dress trimmed with a neckline of crystals and fur as well as reaffirming its relationship with Haute Couture. The dresses have largely been sourced from the Musée Galliera and have been carefully selected by the director of the Galliera, Olivier Salliard along with its curator Anne Zazzo. It’s the first time that dresses, arguably of the highest level of craftsmanship ever seen, have come together in this way. Prime examples that span the time from Charles Frederick Worth to Jeanne Lanvin to Dior to Cristóbal Balenciaga to Courrèges to Thierry Mugler to present day new generation hopefuls like Yiqing Yin are chronologically laid out alongside behind the scene photography, drawings and examples of French savoir-faire from the craftsmanship greats such as Lesage and Lemarié. Saillard’s voice in fashion as a curator and also as a fashion performer in his own way is purist. Remember his thrilling performance with Tilda Swinton, staged last season? We spoke to him about his views on haute couture and its blurred lines with ready to wear and his resistance against moribund houses coming back to life. Dazed Digital: How would you personally define haute couture? Olivier Saillard: It’s a special art dedicated to clothes and it’s completely hand-made art in an atelier in Paris. I have another description though. Everybody who is doing “another” couture is doing haute couture. For example, Rei Kawakubo is doing a sort of “haute couture” or even someone like Yohji Yamamoto, Nicolas Ghesquiere or Azzedine Alaia. They’re doing singular and complex clothes. For me, they’re people who are doing clothes that are even more haute couture than the ones that are supposedly haute couture. Haute couture is about different clothes - “another” couture. DD: You’ve included designers that are not necessarily household names - why is that? DD: How do you feel about the constant revival of fashion houses? Olivier Saillard: The last time I saw a beautiful house reborn with brilliant clothes was when Nicolas Ghesquiere debuted for Balenciaga. Nobody was anxious at the time. It’s more comfortable to develop at your own pace. I’m anxious for people like Hedi Slimane and Raf Simons because they have a lot of pressure. On them I’m more touched by people like Bouchra Jarrar, doing her own thing and maturing from season to season. DD: It’s a weird nostalgia isn’t it to constantly revive these houses? Olivier Saillard: I don’t know why this happens. Jacques Fath and Charles Frederick Worth for instance (which are being reborn) - these names are harder to communicating to the public than new names because their history is not well known. It’s a sign of the times. Probably we will see new names in the future. It’s more interesting and passionate to invent your own story. It’s quite bizarre to create for another label, for another identity.